Steve: Remember the ABCs of Coach Hunting: Anybody But Cowher! As of this writing, over on the Baltimore Sun’s webpage, their informal poll on who should be the next Ravens coach shows Rex Ryan at #1 with 30.6% of the votes and Bill Cowher #2 with 29.5%. ARE YOU KIDDING ME RAVENS FANS??! BILL COWHER?!?! What the hell planet are you living on where we suddenly embrace a guy who we spent 11 seasons absolutely hating simply because he is the “best man for the job?” If Steve Biscotti woke up tomorrow morning and “changed his mind” (as he is prone to doing, apparently) about wanting to be the owner of the Baltimore Ravens, thought about it for a few minutes, and decided that maybe ol’ Jimmy Irsay would be the “best man for the job,” would you be OK with that too? And what if the Ravens do hire Cowher as their next head coach? And Billy Boy decides that, you know what? The “best man for the job,” at roaming safety for the Ravens isn’t Ed Reed…its Troy Polamalu. So he trades Reed and a 3rd round pick to the Steelers for that nappy headed ho. Oh yeah, and the “best man for the job” at blitzing linebacker isn’t Bart Scott….its Joey Porter. So Billy Boy Cowher and Billy Boy Parcells agree to send Bart to south Florida and let Joey do his mud-hole stompin’ right here at M&T for the next 4 years. Are you OK with that too? 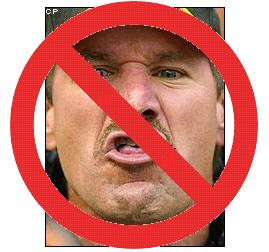 If you endorse Cowher as Ravens head coach, please turn in your purple at the front desk, you won’t be needing it any more. “Best Man for the Job.” Give me a f**king break. Now that that’s out of the way, we can start thinking about those who would actually make sense here in B-More. As for Ryan, he obviously wants the job, telling the Sun that he would be “a good fit, based on the facts.” He is far from the only person of interest though, as Stephen over at Ravens TD tells us that the Ravens have identified as many as THIRTY potential candidates. The squealers took a chance last year with a little-known coordinator named Omar Epps Mike Tomlin, and so far, it looks like a good move. Everyone knows who Josh McDaniels and Jason Garrett are at this point, but there are plenty of other guys out there, any of whom could walk into that interview room at 1 Winning Drive and completely Wow the Ravens brass. Be open minded on this one, Ravens fans, and don’t fear the change that is coming…but please, don’t do a complete 180 on a guy just because he traded in his terrible towel for a microphone. This entry was posted on March 14, 2008 at 12:38 pm and is filed under Ravens. You can follow any responses to this entry through the RSS 2.0 feed. You can leave a response, or trackback from your own site.